Levi: How did you first become a part of the NYC literary scene? What were your first impressions of the "scene", and what are your impressions of it today? Ron: To be honest, I’ve never really been a part of the NYC literary scene. 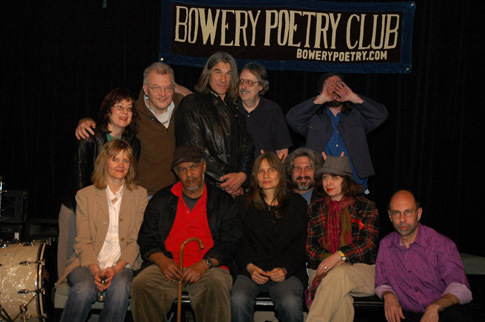 There was a brief period when Eileen Myles was the Director of the Poetry Project that I got paid to read there and was part of the New Years Benefit Reading -- but I was writing fiction then; small dirty stories about a couple (Duke & Jill) that sold junk on the street, and since I wasn’t a Language Poet, or any of that ilk, I fell off their radar, which was fine by me. What I did do was work in bookstores. I was at the Strand in the early to mid 70’s, when Richard Hell, Tom Verlaine and Patti Smith worked there. In the late 70’s I worked in the East Side Bookstore with guys who would later found St. Mark’s Bookshop –- that’s where I got stabbed by a junkie, etc. By 1980 I was managing a bookstore in Soho, pre-tourist trap Soho, which was owned by High Times Magazine. I had to take a subway uptown to their office, where I partook from the canisters of nitrous oxide standing around everyone’s desk, before getting the checks I needed to pay for things signed. Then I worked at St. Mark’s Bookshop, and finally at Coliseum Books. I mention bookstores because this was the pre-internet era, and bookstores provided a similar service back then. If you wanted to check out what was going on in the literary world, you had to actually leave your house and go to a bookstore and pick up a book or a magazine and read it. I had my own small press during this period, called Low-Tech Press. I published Art Spiegelman, Tuli Kupferberg and Hal Sirowitz, among others. But I lucked out in the mid-80’s when a small group of disgruntled writers started meeting and drinking in Tin Pan Alley, a punk-pimp bar on 49th street in the Times Square area. That group later became the Unbearables. I guess we were part of the New York literary scene to the degree that folks attended our actions and readings, and perhaps read and collected our artifacts; anthologies, assembling magazines, etc. The scene in the early days was much more clearly defined; there were simply fewer people living in the city -- everyone kind of knew each other. Now everyone seems much more career oriented -- there’s kind of a frenzy afoot -- these seem like last days, or certainly lost days, to me. Levi: You've been a ringleader of the Unbearables for a long time. How did this thing get started? Has it always been your goal to be part of a thriving literary underground? Did you ever want to go "mainstream" as a writer instead? Ron: Man, I worked in a bookstore part-time when I was a kid in college, in Pennsylvania -- I guess I’ve always worked in some bookstore or another – and I read about the Surrealists when I was supposed to be shelving books. They provided the model for what eventually became the Unbearables; a group of writers and artists making cool stuff while having a good time. The original Unbearables were just a bunch of friends that liked to drink and shoot pool, as well as write. Our history is as much a map of NYC bars as a list of events and performances. We did put out assembling magazines and anthologies, so we’re left a trail of evidence behind us, and I think we had a pretty good time doing it -- I certainly did! As far as the word ‘mainstream’ is concerned, I’ve always thought of it as being a synonym for the droppings of the Empire. That isn’t to say that I don’t wish for our stuff to amplify -- I do. But in the way that instant obsolescence is built into so many devices that are produced for mass consumption, that same throw-away mentality is intrinsically part of the art products (books, etc) that are being flogged as well. I’d like the think that our anthologies, etc, have some staying power built into them -- they’re meant to last. And the mere fact that they’re not throw-aways almost makes the producing of them a political act. So the simple answer to "would I ever have wanted to go mainstream" would have to be "no" -- I don’t think I have anything to offer the Empire that it wants, or needs. I do hope that we’ve created some stuff that some folks who live within the Empire will find nutritious. Levi: The Unbearables seems to enjoy beating up on the Beat Generation writers. I love the sense of fun with which you do this, but I have trouble finding a larger purpose behind it. Do you really think the Beat writers were rotten to the core, commercial fakes, hipster millionaires? In the final summation of things, wasn't Jack Kerouac still just an awesome writer? Wasn't there really something wonderful, beyond all else, about the fact that a creature such as Allen Ginsberg existed? Ron: I do hope the satire and irony in everything we do is obvious. Damn, we are the beats -- in many ways. We dress poorly, we travel around a lot, usually because we’ve just gotten thrown out of our current digs -- or because we lucked out and got some arts group in Europe to pay for the trip there. The whole Crimes of the Beats thing was mainly a way to change our name. We started out as the Unbearable Beatniks of Light, a name bestowed upon us by Mike Golden, one of the original Unbearables, in a short story. We figured the Beats already had their myth, and we wanted our own, so we changed our name in a dramatic fashion. Sure, Kerouac was a fine writer, and I enjoyed reading his books, though the "gee whiz" attitude in On the Road gets a bit tiring at times. 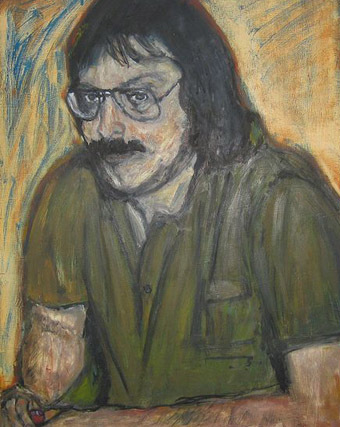 And as far as Allen goes, I knew him – we used to distribute his books at New Morning Bookstore in Soho, and he would visit St. Mark’s Bookshop and say hello from time to time. I’m probably way too much like him -- the irony isn’t lost on me -- though I’m not claiming to be as good a poet. I mean more in the business of literature sense. Levi: When I met you in the mid-90s you were managing the excellent Coliseum book shop on 57th Street and 8th Avenue, which I believe was named for the nearby New York Coliseum (the Coliseum is now gone, replaced by the Time Warner Center, and Coliseum Books is gone too). You mention in your recent book that you've also worked at the Strand on 12th Street, which thankfully is still going strong. Some people are worried that bookstores, and the culture that forms around them, are in trouble in the digital age. More broadly, some people are worried that book culture as a whole is in trouble in the digital age. What do you think about all this? Ron: The answer to this one is, for me, clear. The delivery systems for music have changed dramatically over time – from sheet music, to vinyl, to cassettes, to CDs, to MP3s -- but the music hasn’t changed, just the intermediary. The delivery systems for literature, on the other hand, have not changed that much; they still involve sheets of paper -- easily manufactured, and highly portable. Kindles and other hand-held devices will continue to grow market share, especially among younger consumers, but I don’t think books will disappear. I do envisage the end of Borders and Barnes & Noble -- like all imperial constructs they have certain inherent problems, and the sheer amount of energy it takes to maintain them is unsustainable in the long haul; I think they will break down into smaller, more efficient units one of these days, the same way the Soviet Union has become Russia again. Levi: Your recent Unbearables volume lists books that your contributors hate or were harmed by. You took the personal angle and wrote about a book you wrote. Fair enough, but can you tell me which writers and books you love the most? This article is part of the series The Literary Life. The next post in the series is The Literary Life: Goodloe Byron Gives It Away. 7 Responses to "The Literary Life: A Talk With Ron Kolm"
i'm a believer. That's my comment. Great interviews like this are part of what makes Litkicks a must read for me. I was going to say the same thing danf said. This is the kind of article I look for on Litkicks. My favorite part is, "...in the way that instant obsolescence is built into so many devices that are produced for mass consumption, that same throw-away mentality is intrinsically part of the art products (books, etc) that are being flogged as well. I’d like the think that our anthologies, etc, have some staying power built into them -- they’re meant to last...I don’t think I have anything to offer the Empire that it wants, or needs. I do hope that we’ve created some stuff that some folks who live within the Empire will find nutritious." I wish I worked in a bookstore. Or a public library. Great interview! I've been a fan of Ron's ever since I met him in New York three years ago. He's the best PR guy the Unbearables could wish for - he even made them famous in Belgium! If you ask me, I think he's all too often underestimated as a writer. Great insights on past, present and future of books and bookstores! This is a great interview and brings back many wonderful memories as I once hung out at all those bookstores and liked so many of the same writers. I've read much of Ron's work, and particularly like "The Plastic Factory". He is an excellent storyteller (as you can gleam from this interview) and a great editor and champion of NY's literary scene. Keep up the fine work, keeping us in touch with fascinating people like Ron and the Unbearables.